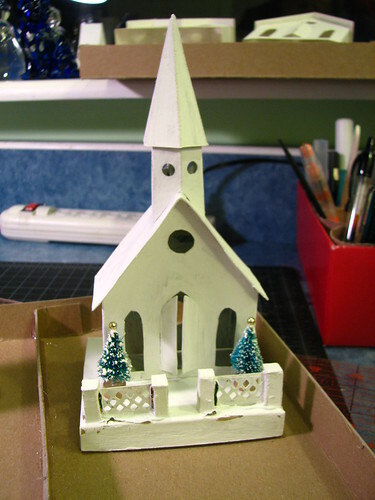 There is a lot of interest currently in Putz houses, or little glitter houses, that were once used to make village scenes under Christmas trees and on mantles. You can read more about them at Little Glitter Houses and Papa Ted’s Place, just to mention two sites. 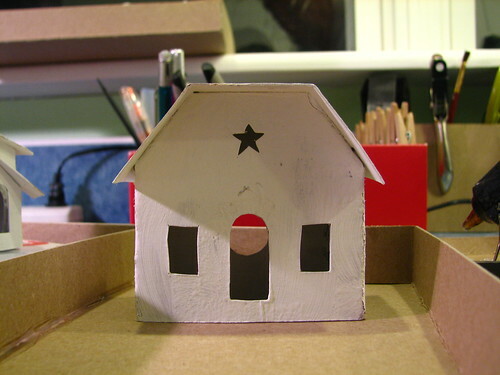 My Pinterest Putz House Tutorial board has more links. 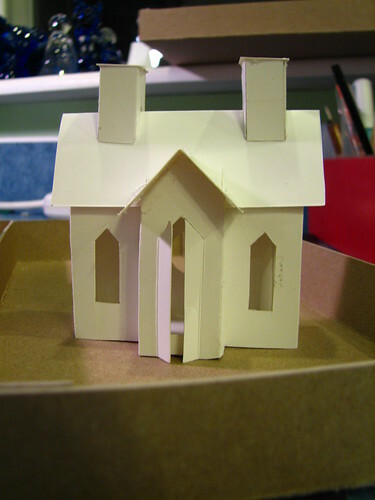 I’ve been drawing patterns for Putz houses this week. 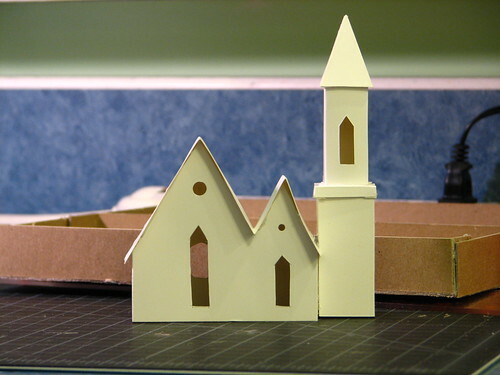 Here are the assembled houses and churches, ready for painting and glittering. Can’t wait! 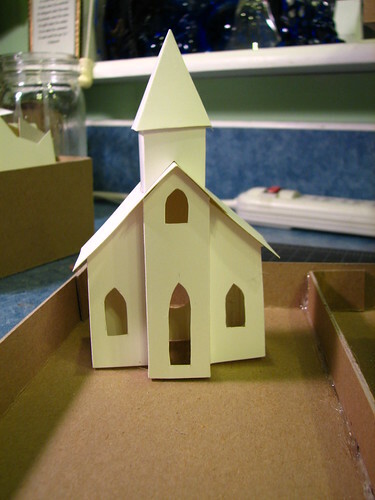 This is a fairly simple church with a nice bump out on the front. This church has a few more details than the others. It’s already on a base and has a fence. I used a hand punch to make the lattice fence. This is a very simple vintage-style Putz. Another simple one, with a bump out front door. This is the church, this is the steeple. I like the roof trim on this house. I made it with a hand punch. Very simple two-story Putz. 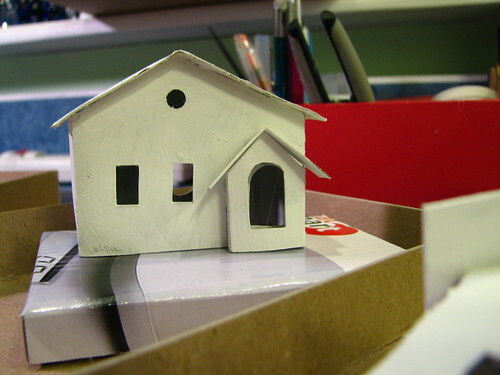 The little roof in front of the house will be glued over the door after painting. I like the two chimneys on this house. 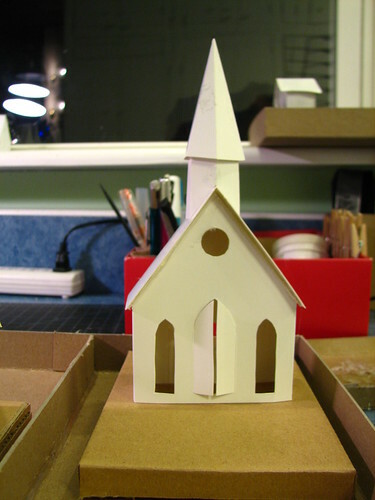 It’s a bit hard to see in this picture, but the steeple tower sits back a bit from the front of the house. Next comes the fun of painting and glittering. I’ll be posting about that soon. This entry was written by ~~Rhonda, posted on February 9, 2012 at 12:45 am, filed under Putz / glitter houses. Bookmark the permalink. Follow any comments here with the RSS feed for this post. Post a comment or leave a trackback: Trackback URL. 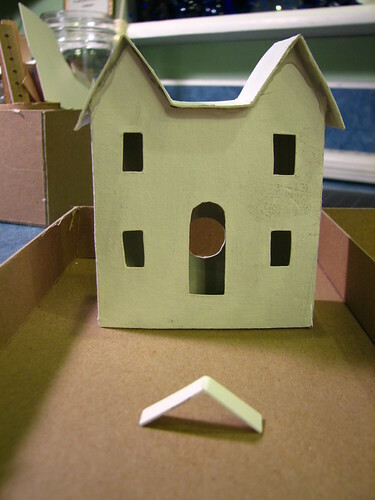 Hi,I have been meaning to ask you,my boyfriend got a chair from walmart and we saved the box.I was wondering if I could use the box to make these houses?Its kinda thick cardboard.Its a pretty big box,I think I could get a couple houses out of it. 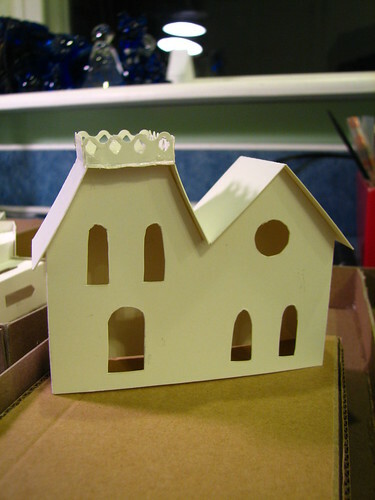 I’m going to make a small village for a friend of mine who’s been sick, I think this will cheer her up. do you print your patterns, or is there another site that does?? Thank you so much for sharing your works of art with all of us!